The water level under Stroud Brewery Bridge is now up to the ‘proper’ level. 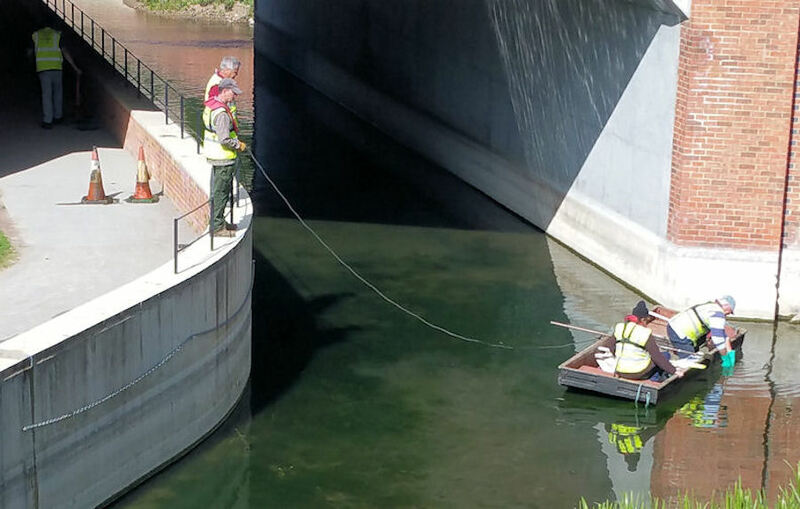 Volunteers from the Stroud District Council’s 'Tuesday & Thursday Team' have recently been hard at work down in the chamber of Wallbridge Lower Lock. The SDC Volunteers began work shortly after after Alun Griffiths Contractors of Abergavenny completed the construction of the Lock by-wash and fish pass in March. The SDC team led by Paul Weller and Jon Pontefract set out by ‘redirecting the river’ as Jon described it. That is to say creating an area immediately outside the lock chamber where the volunteers could work safely in dry wellington boots! Creating the dry workspace was necessary to give the team access to cut grooves in the stonework to receive the stop planks. The planks were fitted and sealed during the last week in April. 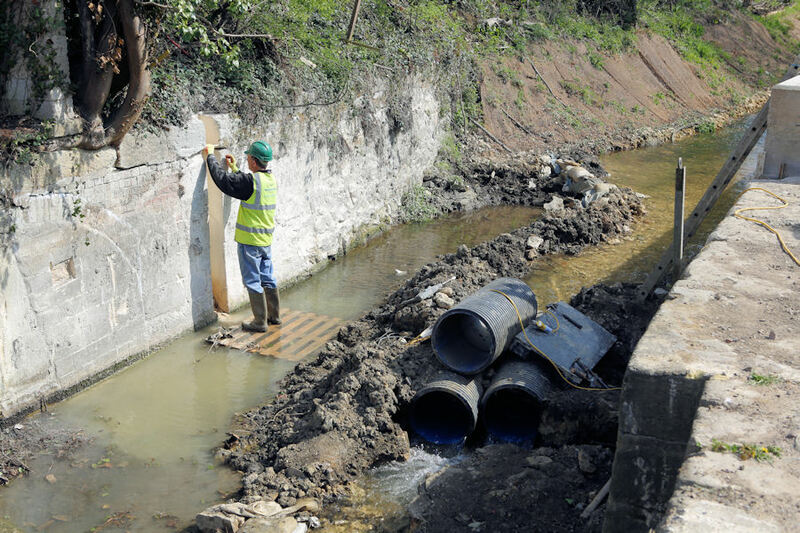 This has created a temporary dam that now holds back and redirects water from Slad Brook into the bywash & fish pass. 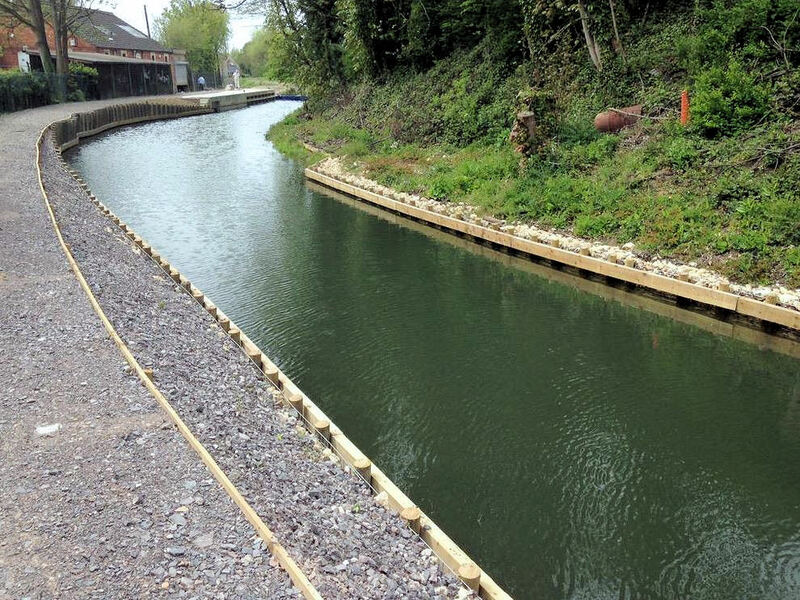 Cotswold Canals Trust Western Depot volunteers led by Frank Laurenson simultaneously lowered a work punt into the shallow water to clear the channel of the detritus that had accumulated in the channel. The water level is now up to the safety chain that can be seen fixed to the wharf edge.